If you look closely, you'll see four different serration points on the knife, three of which are on the handle for easier grip when you have gloves on. There's also a small rise going back along the false edge, and its spear point is perfect for hunting and outdoor use. The knife is built to last. It has a 420 high carbon steel blade, and a locking liner closure system. Plus its contoured handle should make it easier to hold, eliminating the need for finger grooves. 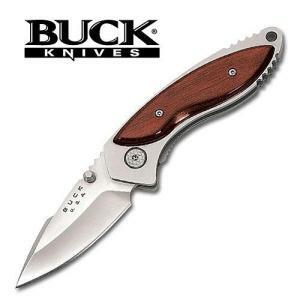 Overall, this folding knife is an excellent choice for an everyday outdoor/indoor knife. It comes with a nice black nylon sheath too.